USE YOUR "BACK" BUTTON TO GET BACK TO THIS PAGE!!!! AD CARD MAD RACING HANDOUT, DALE CREASY JR #1. AD CARD MAD RACING HANDOUT, DALE CREASY JR #2. BALLS, GOLF, ALFRED, WHAT, ME WORRY?" BUMPER STICKER, PRE-MAD ALFRED "WHAT-ME WORRY? BUST/COOKIE JAR, ALFRED, "CRABBY ONION"
BUST, ALFRED E. NEUMAN 3 1/2"
BUST, ALFRED E. NEUMAN 5 1/2"
BUST, PRE-MAD MOSELEY PRODUCTS, 4 1/2"
BUST, SWEDISH ALFRED E. NEUMAN 4 1/2"
BUTTON, PINBACK, ALFRED "UP SIDE DOWN"
BUTTON, PINBACK, BRITISH MAD SUBSCRIPTION "BONUS"
BUTTON, PINBACK, LBJ "WHAT ME WORRY"
BUTTON, PINBACK, NIXON "WHAT ME WORRY"
BUTTON, PINBACK, GOLDWATER "WHAT ME WORRY"
BUTTON, PINBACK, ROSS PEROT "WHAT, ME WORRY"
BUTTON, PINBACK, GEORGE W BUSH "WHAT ME WORRY"
BUTTON, PRE-MAD, "WHAT, ME WORRY?" BUTTON, PRE-MAD, MALMBERG'S "ME WORRY?" BUTTON, PINBACK, "WHAT, ME REGISTER?" BUTTON, PINBACK, ORANGE "WHAT ME WORRY"
CARD, NOTICE (AUSTRALIAN MAD), "WITH OUR COMPLIMENTS"
CHARM, ALFRED E NEUMAN "WHAT ME WORRY"
CLOCK (WALL) "ALFRED FACE WATCH"
CLOCK (WALL) "SPY vs SPY FACE WATCH"
COOKIE JAR, ALFRED "CERTIFIED MAD"
DECAL BOOK, "ALFRED THE BEATNIK"
DECAL SET, "COLLEGE", BEATNIK COOL SCHOOL & ALFRED. DISGUISE KIT, "ALFRED E. NEUMAN"
EARRINGS, "ALFRED E. NEUMAN FOR PRESIDENT"
FAMILY DOG POSTER, SONS OF CHAMPLAIN"
FAMILY DOG POSTCARD "SONS OF CHAMPLAIN"
GOLF BALLS, ALFRED "WHAT, ME WORRY?" LAMP, ALFRED E NEUMAN "BUST"
LICENSE PLATE, OHIO "MAD FOREVER"
LOBBY CARD, "UP THE ACADEMY"
MATCHBOOK COVER, "LITTLE JACK HORNER"
MATCHBOOK COVER, "CARLISLE, HIGHTOWER, GUNBY"
MOUSE PAD, TOTALLY MAD PREMIUM, "WHAT - ME WORRY?" MUG, PRE-MAD ALFRED, "WHAT, ME WORRY?" MUG, PROTOTYPE PLAIN "CERTIFIED MAD"
MUSIC, CD, (AUSTRALIAN) "HARP ON THIS"
MUSIC, CD, (AUSTRALIAN) "SHABBY ROAD"
OUTHOUSE TOY, "ALFRED IN THE OUTHOUSE"
PLAQUE, PRE-MAD ALFRED "ME WORRY"
PLAQUE, ALFRED SILHOUETTE "MAD COLLECTOR"
POSTCARD, PRE-MAD ALFRED "ANTI-FDR #1"
POSTCARD, PRE-MAD ALFRED "ANTI-FDR #2"
POSTCARD, PRE-MAD ALFRED "ANTI-FDR #3"
POSTCARD, PRE-MAD ALFRED "ANTI-FDR #4"
POSTCARD, PRE-MAD, AlFRED "ANTI WILKY"
POSTCARD, PRE-MAD ALFRED "ME WORRY"
POSTCARD, PRE-MAD, "ME WORRY", ALFRED AS G. I.
POSTCARD, PRE-MAD ALFRED, COLOR "#36"
POSTCARD, PRE-MAD ALFRED, PINK & BLACK "#36"
POSTCARD, PRE-MAD ALFRED, GREY "#36"
POSTCARD, PRE-MAD ALFRED "HELLO FROM NEW YORK"
POSTCARD, PRE-MAD ALFRED "PEARL BEER"
POSTCARD, PRE-MAD ALFRED "FROM ONE MUG TO ANOTHER"
POSTCARD, PRE-MAD ALFRED "SO WHAT"
POSTCARD, PRE-MAD ALFRED, "I WORK FOR THE GUV-MINT"
POSTCARD, PRE-MAD ALFRED, I CAN TOOK IT! POSTCARD, PRE-MAD ALFRED, "ME WORRY? ", G.I. POSTCARD, PRE-MAD ALFRED, "ME WORRY? NO"
POSTCARD, PRE-MAD ALFRED, "ME WORRY?, GOOFY"
POSTCARD, PRE-MAD FEMALE ALFRED. "ME WORRY?" POSTCARD, WHAT - ME WORRY, GREAT OAK INN, N.J.
POSTCARD, PRE-MAD ALFRED & WIFE "WE WORRY"
POSTCARD, PRE-MAD ALFRED & WIFE "THANK YOU"
POSTCARD, PRE-MAD ALFRED "SEBASTIAN INN"
POSTCARD, PRE-MAD ALFRED "WEAR A SMILE"
POSTER, "ANOTHER RIDICULOUS MAD PRODUCT"
POSTER, C. B. MOSELEY CO. "PRE-MAD"
POSTER, "CHEAP SOUVENIR OF YOUR VISIT TO MAD"
POSTER, "STATE OF THE MAD ART"
POSTER, CONCERT, "SONS OF CHAMPLAIN FAMILY DOG"
POSTER, DON MARTIN "SAVE THE ENVIRONMENT"
POSTER, FINISH MAD "ALFRED FAMILY TREE"
POSTER, GERMAN MAD "NU UND...?" POSTER, MARK COHEN ART SHOW, N.C.
POSTER, MOVIE, LARGE "UP THE ACADEMY"
POSTER, MOVIE, SMALL "UP THE ACADEMY"
POSTER, PSYCHEDELIC FLOCKED "BLACK LIGHT"
POSTER, MAD "UNCLE SAM WHO NEEDS YOU?" 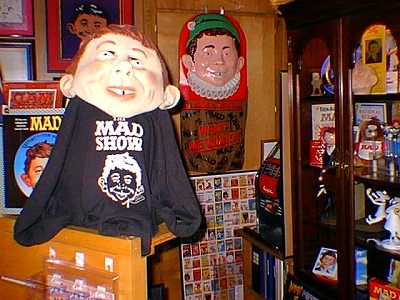 PROGRAM, PREVIEW PROGRAM, "THE MAD SHOW"
PROGRAM GUIDE, PLAYBILL, "THE MAD SHOW"
PUPPET (HAND), ALFRED "WHAT, ME WORRY?" RADIO PROGRAMS, TAPE, "MAD MINUTE RADIO SHOWS"
SHIRT, SWEAT SHIRT, MAD "WARNER"
SHIRT, T-SHIRT, ALFRED E NEUMAN LONG SLEEVE "ORIGINAL"
SHIRT, T-SHIRT, ALFRED E NEUMAN SHORT SLEEVE "ORIGINAL"
SHIRT, T-SHIRT, SUN "WOMAN, DOG & ALFRED"
SHIRT, T-SHIRT, "ALFRED BUZZ CUT"
SHIRT, T-SHIRT, "ALFRED IN STRAIGHT JACKET"
SHIRT, T-SHIRT, "ALFRED THE BIKER"
SHIRT, T-SHIRT, "SPY vs SPY / ALFRED"
SHIRT, T-SHIRT, "SPY vs SPY"
SHIRT, T-SHIRT, "BORN TO BE MAD"
SHIRT, T-SHIRT, "IT'S A MAD, MAD, MAD, MAD WORLD"
SHIRT, T-SHIRT, THE "MAD READER"
SHIRT, SWEAT SHIRT, CHILDREN'S "MAD BABY"
SHIRT, T-SHIRT, CHICAGO POLICE "OUR BARS NEVER CLOSE"
STAINED GLASS PICTURE, ALFRED "GOOD N' MAD"
STATUE, ALFRED E. NEUMAN 12"